The IRS Inspector General issued a report this month finding that the IRS – the federal agency responsible for protecting the public by investigating and stopping impermissible political activity by tax-exempt entities (primarily involving 501(c)(4) organizations) – frequently fails to do its job. The Senate Finance Committee had asked the Inspector General to review the situation after the Committee conducted a bipartisan investigation that found the IRS had not examined any complaints between 2010 and 2014 that alleged 501(c)(4) organizations had gone further than the law allows in political activities. The IRS Inspector General investigation found that of more than 6,500 complaints filed over 14 months, the special committee the IRS had established to review such complaints had actually received only 19 complaints and in turn had recommended 10 for examination, but only five had been done and no negative findings had been issued. This summer, the Treasury Department and IRS issued Revenue Procedure 2018-38 announcing that nonprofits other than 501(c)(3) organizations will no longer be required to identify the names of donors who contribute more than $5,000. The changed disclosure rule applies to 501(c)(4) social welfare organizations, 501(c)(5) labor unions, and 501(c)(6) trade associations, all of which are permitted to engage in some – but not unlimited – partisan, election-related activities because donations to them do not generate charitable tax deductions for donors. The concern of many is that by turning a blind eye to the funding of partisan campaigns through ostensibly “independent” nonprofit organizations, the IRS is encouraging individuals to spend heavily in the upcoming midterm elections with the promise of anonymity. See the National Council of Nonprofits statement for how the revocation of donor disclosure rules for noncharitable nonprofits could impact charitable organizations. A proposed final rule from the U.S. Department of Homeland Security and U.S. Citizenship and Immigration Services would require government officials to place greater weight on an immigrant’s medical history and income levels when determining whether to grant or deny immigration status. Under current law, non-citizen individuals who seek adjustment of immigration status or a visa, or who are applicants for admission to the country, must establish that they are not likely to become a "public charge" (i.e., a burden on taxpayers). The proposed rule would, among other things, expand the number of federal programs that, if utilized, would count against a family when the government considers their public charge status in the context of seeking admission to, or permanent legal residence in, the United States. Nonprofits and advocates are expressing concern that the revised approach, while less intrusive than an earlier draft, would still have a chilling effect on some immigrants that will discourage them from seeking medical coverage or care. It has been estimated that if the proposed final rule is approved and implemented, it may cost $33.8 billion in economic loss and 230,000 lost jobs. Public comments are due December 10. U.S. Commerce Secretary Ross spoke with a senior White House official and others who wanted the controversial citizenship question added to the 2020 census, according to a new court document. Ross previously testified to Congress that the Justice Department in December 2017 had “initiated” the request to add the citizenship question, purportedly as a way to better enforce the Voting Rights Act. The new court filing indicates that Secretary Ross spoke with former White House adviser Stephen Bannon in the spring of 2017 about adding the citizenship question. The question of who initiated the effort to include the citizenship question is central to a law suit filed by multiple state attorneys general seeking to remove it from the 2020 census questionnaire. Last week, Department of Justice attorneys petitioned the U.S. Supreme Court to overrule the federal trial judge’s order that Ross must sit for depositions in that case. Justice Ginsburg put a temporary hold on the lower court’s ruling to allow those challenging the citizenship question to file a response. States continue to grapple with the effects of the 2017 federal tax law on their income tax systems and are responding in multiple ways to conform their laws and, in most cases, avoid automatic tax hikes. Some, like South Carolina, are enacting legislation to either conform with or decouple from the federal tax law. In other states, executive branch agencies are overseeing at least some aspects of implementation. A proposed rule by the Florida Department of Revenue would eliminate the state’s alternative minimum tax for corporations. The Arkansas Department of Finance and Administration has announced that moving expenses will continue to be excluded from gross income under state law until legislative fixes can be enacted despite repeal in the federal tax law. The Oklahoma Tax Commission, under a new rule awaiting approval by the Governor, will limit itemized deductions to $17,000, but charitable contributions and medical expenses are exempted from the cap. Nonprofit experts predict that the state 2019 legislative sessions will be the most active and challenging in a generation as legislatures open their tax laws to conform to the federal law and make other long-sought reforms that could benefit or undermine the work of nonprofits and foundations. More than 7,700 organizations and individuals submitted comments to the Treasury Department and IRS regarding proposed regulations affecting the federal deductibility of donations that generate state tax credits. The draft rules, published on August 27, reportedly targeted new state tax laws in Connecticut, New Jersey, and New York seeking to convert some state and local tax (SALT) payments that are capped at $10,000 under the 2017 federal tax law into uncapped charitable donations by granting state tax credits for contributions to government-run nonprofits. The proposed federal rules, however, also apply to pre-existing state tax credit programs that encourage donations to many types of charitable giving programs benefiting charitable endowments, schools and scholarship programs, historic preservation and conservation, and more. If formally adopted, the proposed rules would require taxpayers to deduct the value of the tax credit from the charitable donation. 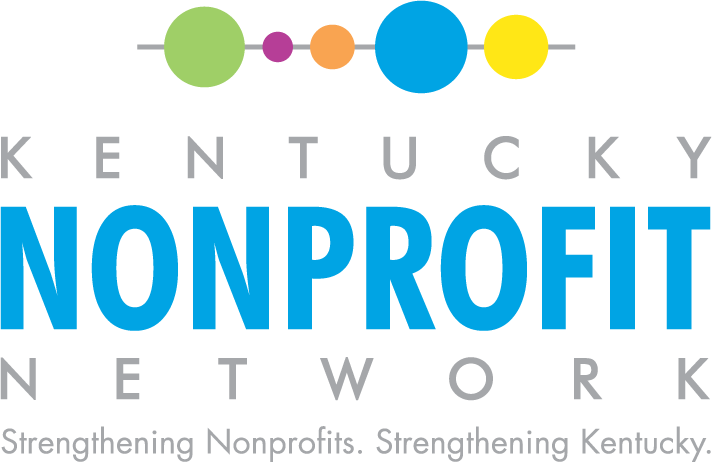 State associations of nonprofits were among the groups that offered public comments seeking to revise or improve the draft rules. The North Dakota Association of Nonprofit Organizations offered strong support for the state’s 40 percent state tax credit for contributions to qualified endowments. Citing the state’s low ranking of in-state foundation assets, the state association of nonprofits made the case that the tax credit “has strengthened North Dakota by encouraging charitable giving to support nonprofits’ work to improve [their] qualify of life” by keeping money in the state. The Montana Nonprofit Association, also referencing low in-state philanthropy dollars, recommended alternative approaches, including creating an exception for endowment tax credits, grandfathering pre-existing tax-credit programs, and/or raising the de minimis exception in the proposed rule from 15 percent to 50 percent. Similarly, the Colorado Nonprofit Association argued the proposed rule is overly broad and “should be targeted specifically to the challenges raised by SALT workaround laws.” In their view, tax credits that incentivize voluntary donations to nonprofits should be spared from the rulemaking. State governments likewise submitted comments seeking to alter the draft rules, but with different outcomes in mind. New York submitted a letter from Governor Cuomo, as well as formal comments from the state Department of Taxation and Finance, Politico Pro reports. In his letter, Cuomo wrote, “These regulations lack any basis in the law, upend decades of precedent without any authorization from Congress and arbitrarily discriminate against tax credit programs established in New York to protect our taxpayers from the federal government’s economic attack on our state.” The Colorado Department of Revenue, on the other hand, asked Treasury and the IRS to narrow the proposed rules to apply only to the efforts of states to circumvent the $10,000 cap on state and local tax deductions. PILOTs: Some Connecticut lawmakers want Yale University to pay up to half of the tax rate on the property it owns in New Haven, despite the fact that the state constitution expressly exempts the university from property taxes. Currently, the Ivy League school makes the highest “voluntary” payments in lieu of taxes (PILOTs) of all universities across the country - $7.5 million, which is rising to $10 million this year. The city, however, is near bankruptcy and the state hasn’t honored its statutory requirement to support local governments. Under Connecticut’s unique law, the state is supposed to reimburse cities at a rate of 77 cents for every $1 of untaxed property owned by an institution of higher learning, an obligation the state has never met; recently, the state paid only 33 cents on the dollar. For an interesting overview of PILOTs, read Towns, Gowns, & Real Estate (Governing, October 2018). Sales Tax: Nonprofits in Arkansas must collect and remit sales tax on tickets to events under a new legal opinion from the state Department of Finance and Administration. The government agency stated that it views nonprofit events as being similar to and competing with entertainment events hosted by for-profit corporations, and thus it ruled that nonprofits should be subject to the tax. Sales by vendors and the rentals of chairs and tables at the events are also taxed, but booth rentals are not if the space is rented out. Tax Incentive: Despite the uncertainty created by the proposed regulation to limit the federal deductibility of donations that generate state tax credits (see above article), a new bill introduced in Michigan would offer a 50 percent tax credit, with caps, for individual and corporate donations to community foundations meeting certain requirements. Nonprofits Get Out the Vote! Now that the National Voter Registration Day has come and gone, nonprofits dedicated to democracy and community engagement are turning to nonpartisan get out the vote (GOTV) efforts before and on Election Day, November 6, 2018. Charitable nonprofits, of course, cannot suggest which candidate to vote for or political party to support (or oppose), but many are committed to providing information about the voting process like early voting dates and hours, nonpartisan voter guides, reminders about Election Day matters (such as voting precinct locations), and other kinds of assistance to help someone register and vote. 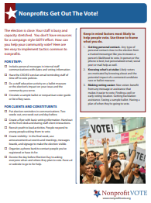 Nonprofit VOTE has developed a helpful GOTV guide with 10 easy-to-implement tactics common to nonprofits and background information to help organizations remain nonpartisan and community focused. "It will take Americans completing their tax returns for a year or two and then seeing that (a) there is not really the incentive and (b) not really that much more money in their own personal savings from taxes, and therefore they will not be giving as much." ~ Tim Delaney, President and CEO, National Council of Nonprofits, quoted in ‘Nuanced' tax law is no gift to charities, Crain’s Cleveland Business, October 13, 2018, explaining the likely impact of the 2017 federal tax law on charitable giving and the delay in understanding how the work of charitable nonprofits ultimately may be affected. ~ Robert J. Vanni of the Nonprofit Coordinating Committee of New York, quoted in The new tax bill’s war on churches (and other nonprofits), Religious News Network, October 20, 2018, speaking about how the 2017 federal tax bill (1) now taxes nonprofits, including houses of worship, on parking and transportation benefits, (2) reduces charitable giving incentives by doubling the standard deduction, and (3) restricts states and localities’ abilities to make up for federal charitable giving by capping the state and local tax deduction. ~ Mary Kate Bacalao, Nonprofit Contracting: Breaking the Cycle of Public Underinvestment, Nonprofit Quarterly, October 3, 2018, expressing the commonsense view that investing in social services is indeed an investment that yields benefits for lives and finances, and that arbitrary restrictions imposed by governments can adversely affect the outcomes that all are seeking. ~ Melinda McAliney, Director of the Brown Sisters Foundation and Vario Philanthropy, quoted in Advocacy with a Small "a" - Big Ideas for Small Foundations, Jenny Chandler, Exponent Philanthropy blog, October 15, 2018. Building a New Narrative on Human Services, National Human Services Assembly, a communications tool kit that provides research, recommendations, and sample communications designed to help people connected to nonprofit human services explain the importance of the work in communities when talking to funders, office holders and candidates, reporters, and the public. Doug Sauer, President and CEO of the New York Council of Nonprofits, and Sharon Stapel, President and CEO of the Nonprofit Coordinating Committee of NY, have been named to City & State New York’s 2018 Nonprofit Power 50, recognizing the most influential people in New York’s nonprofit sector. Dissecting & Debunking the "Johnson Amendment", Brian Kaylor, podcast series “Baptist Without an Adjective,” October 9, 2018, in which the host reports on the law protecting nonprofit nonpartisanship (the Johnson Amendment), offering historical context, debunking some common myths, and encouraging listeners to join the effort to protect the political campaign activity ban. Number of eligible voters updating their registration or registering for the first time on September 25, marking the largest National Voter Registration Day on record. The registration drive was a success thanks to the engagement of 4,087 community partners, 52 premier partners, 10 premier sponsors and thousands of volunteers across the country. Source: Biggest National Voter Registration Day Ever, news release, October 2018. Voter registration deadlines are fast approaching. Not all states have same-day or automatic voter registration, or no voter registration at all (North Dakota), so be sure to double check your state’s deadline to make sure you can vote! And spread the word.